Born on April 20, 1889 in the town of Braunau in Austria, Adolf Hitler became one of the most infamous figures in history. He was heavily involved in German politics, becoming the leader of the National Socialist German Workers Party, better known as the Nazi party. From 1933-1945, he became ruler of Germany and became head of state from 1934- 1945. Hitler’s beginnings were humble. His parents had both belonged to poor peasant families. Though his father, Alois Hitler was the illegitimate child of a housemaid, his ambition lead him to become a customs official. He held high hopes for his son, encouraging him to do well at school and beating him when he considered it fit. Hitler formed a close relationship with his mother. In contrast, he constantly came into conflict with his father’s authoritarianism. Hitler served during World War I in the German army, winning many awards for bravery. After the war, in 1919, Hitler became a member of the German Workers’ Party. He appealed to Germany’s conservatives by blaming the country’s post-war problems on the Jews. By 1921, he had become leader of the Nazi party. Two years later, he attempted an armed uprising for which he was imprisoned. During this time in jail, Hitler wrote Mein Kampf, a document which detailed his life as well as his political ideology. 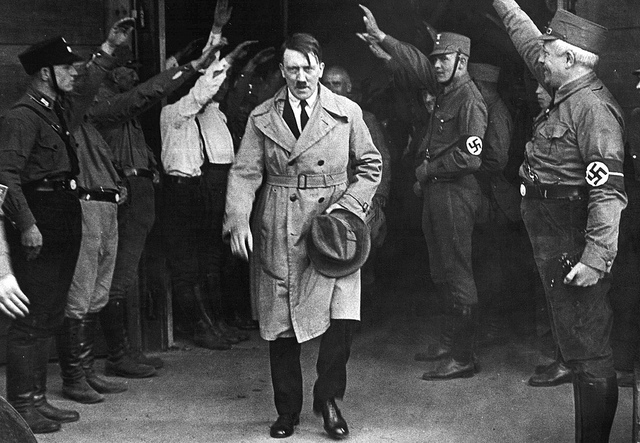 Upon his release, Hitler attempted to rebuild the Nazi party. After the 1932 elections, it became the largest party, sealing the Nazi’s status as the most influential political group in German parliament. In 1933, Hitler began to institute anti-semitic laws after becoming chancellor of the German government. In 1939, he invaded Poland, beginning World War II and initiating the holocaust. On April 30, 1945, Hitler committed suicide in Berlin.